What motivated me to want to create a web site? I have been very involved in using the computer since I began to work with those friendly PETS in the early 1980's. Over the years I have used Logo Language, Word Processing, and HyperStudio. After taking a "Classroom Presentations" class at Chittenden Center, I began using the computer as a teaching tool with such programs as Astound and PowerPoint. The idea of placing my students' writings and photographs on an internet web site appealed to me. What better way to showcase their work? I looked at many elementary school sites and concluded I could do it. I first practiced on an Angelfire site in the fall of 1996. Angelfire is free, and I learned quite a bit. My students were able to type in their essays, and I was also able to upload their text files. Making changes was simple. It was a satisfactory start. Alas, loading photographic images was difficult, and when Angelfire crashed, we lost everything. I felt we needed a website where I could store a copy on my own computer. I next purchased PageMill , an editor program, and began to put together a small web. I had no idea how I would launch it. I also began learning a bit of html, a direction I would not recommend. Before I was ready, I found myself and others at Chittenden, a local Science Center, making a web using the editor program FrontPage. This was fun, but the missing ingredient was Control. I still did not have control of the web site. I could not make additions and corrections at will. In the summer of 1997, I started learning FrontPage for Macintosh and also for PC. The PC used was the one we made in Goals 2000. I went through the tutorial on both the Mac and PC. (There is little difference) Pages could be moved back and forth between the two computers with few problem. I practiced making pages and pages and pages. I downloaded other people's webs and studied their techniques. Several books I found useful were FrontPage 97 Unleashed by Staneck, Wild Web Graphics with Microsoft Image Composer, and PhotoShop 3. I would guess I averaged three hours a day all summer. I made many false starts along trails I decided not to follow. When I needed help, I'd e-mail Tom Johnson at Chittenden, or Jim Stamm in Benzonia. Well, we had a web site, and a few pages. However not many in town, or even on our staff, knew we existed. I had not anticipated being the PR person. I began making posters covered with web pages. I attached little tear off notes giving the address. Most of this type of advertising was done within our school. I needed the teachers to see the value of the site. More parents seemed to find us as teachers sent home notes with our web address. Then came the big breakthrough: Many teachers discovered the digital cameras. They were easy to use! Teachers began borrowing the cameras, taking pictures in their classrooms, and writing paragraphs to go with each picture. By this time I was spending 20 to 25 hours a week on the web. Each night I would come home, down load teacher's photographs from the cameras. Then I would pull each image individually into PhotoShop 3 and decide what to do with it. I would generally crop, brighten, and save with a name that made sense (to me). I would make new pages, add the digital images (and hopefully the paragraphs the teacher or students wrote). I tried explaining that teachers needed to delete any pictures that they didn't want before giving them to me. I put little notes in each camera case explaining how to do that. I asked teachers for more text to explain the event. Student quotes from the youngest children, or student written paragraphs from the older children was what I really wanted. I was giving myself a whole lot of work. Soon I began to think I was suffering from Sleep Deprivation! That's when I decided I needed to begin Stage 3. Stage 3: Teaching Staff Members to maintain their own homepages. The next obvious step seems to be to train individuals to make and manage their own pages. So..... I made a worksheet for teachers! Stage 4: Who knows what happens next? Every year our administration has us write goals for the coming year. Every year I end up involved in activities I did not even know existed in September. That's how it was with HyperStudio, PageMaker, PowerPoint, and my now over 100 page Elementary Web Site. Who knew? But each has been an exciting adventure. I've loved every minute of making our Onekama Elementary School Web Site. This Onekama Elementary School site was created using Microsoft's Front Page . 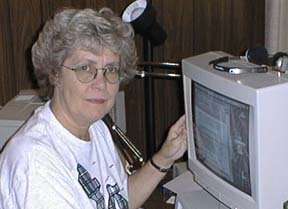 Both a Macintosh and a PC were used. Most headlines were made with Microsoft's Image Composer. At first all the photographs were generated by an Olympus digital camera . Later, a Ricoh digital camera, part of Goals 2000 was also used. Images were pulled into Adobe's PhotoShop on a Macintosh computer. Other photographs were taken with a camcorder and captured by Apple Video Player. Student art was scanned on a the Printer/Copier/Scanner, provided by the Goals 2000 Program.